Rail technology leader Bombardier Transportation announced today that New Jersey Transit Corporation (NJ TRANSIT) has exercised an option for 17 additional BOMBARDIER ALP-45 dual-power locomotives. This second call off is valued at approximately $160 million US (133 million euro) and is based on a contract for 26 locomotives signed in 2008. NJ TRANSIT exercised a first option for nine units in 2011 and the contract includes options for up to 37 more units. The dual-power locomotives are capable of operating under both diesel power and alternating current electric power from overhead sources. Their flexible power system enables the locomotives to operate across the entire NJ TRANSIT rail system, which includes both electrified and non-electrified lines, thus allowing passengers to ride a single train between New Jersey and New York Penn Station without having to change trains. Their introduction in 2011-2012 at NJ TRANSIT and the then Agence Métropolitaine de Transport in Montreal (now named Réseau de transport métropolitain) marked a first for this technology in North America. The locomotives will be manufactured at Bombardier sites in Germany and Poland. Delivery is scheduled to start in November 2019. NJ TRANSIT is the largest statewide public transportation system in the United States and an established customer of Bombardier. 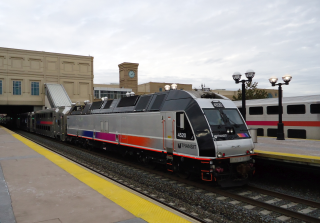 Over the years, Bombardier has provided 100 electric and dual-power locomotives, hundreds of push-pull commuter coaches, and 429 Multilevel vehicles to NJ TRANSIT. In addition, Bombardier was a member of the consortium that designed and built NJ TRANSIT’s turnkey RiverLINE light rail system between Camden and Trenton, New Jersey and now operates and maintains the system under a contract with NJ TRANSIT.